A fan-made game featuring a Mickey Mouse parody has been shut down after scammers posing as Disney lawyers threatened legal action. 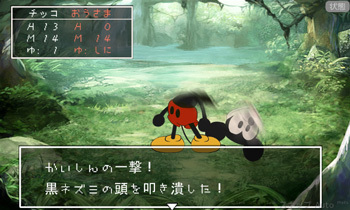 Hanako, a "doujin" visual novel, recently made the headlines thanks to a scene in which players encounter Mickey Mouse - the original, mildly-terrifying version with the soulless, beady black eyes - and promptly knock his head off. Shortly after images of the game reached gaming news sites, the development group, AmoRico, received an email from some enterprising scammers posing as Disney's legal team. The scammers wanted Â¥6 million, around $78,000 US dollars, in reparations for the supposed copyright infringement. AmoRico eventually contacted a Disney rep, only to find out the company had never heard of Hanako or any legal threats. Unfortunately this brush with legal disaster seems to have spooked the game's developer, and he's calling it quits. "They're saying online it's a "Mickey Massacre Game". Those who've played it know, but it's not that sort of content. They've cut out all the good art and movie content from Chikoraji and are sharing it around saying I "killed" and "chopped" Mickey, I was so shocked to find out, I feel sick," he wrote on his blog. "Doujin" and "Doujinshi" are terms used to refer to fan-made products often, but not always, based on existing characters. Those based on copyrighted material are technically illegal, at least according to Japanese copyright law, but Japanese companies tend to turn a blind eye provided the creators don't get too cheeky. While Disney has a long history of aggressively defending its trademarks, the company seems to have mellowed somewhat in recent years. In 2011, Disney took a British store-owner to court to prevent him from trademarking the name "Pooh Corner." Disney won the legal battle, but then granted the shop-owner permission to use the name anyway. The fact that J. Scott Campbell hasn't been sued into oblivion over his obviously-based-on-Disney-characters Fairy Tale fantasies calendars, also indicates that Disney's lawyers may be losing their notorious thirst for blood.